Does Bluetooth Caskeid make the Pure Jongo T4 the ultimate home speaker? The Pure Jongo T4 may have been around for a while, but Pure has breathed some new life into it with a natty new feature. It's called Bluetooth Caskeid (pronounced 'cascade'), and it lets you stream any audio app through multiple speakers using a combination of Bluetooth and Wi-Fi. In other words, you're completely unrestricted in what you can play wirelessly. 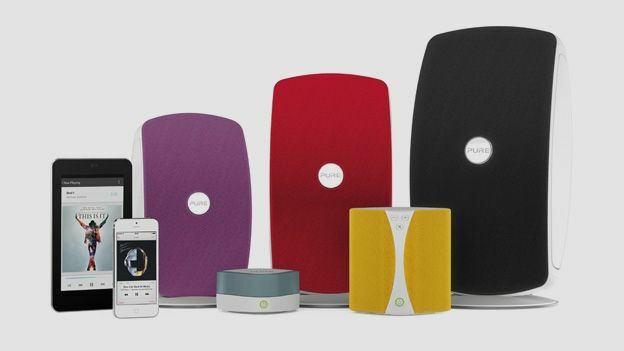 All you need is an Android or iOS mobile device, and a couple of Pure's Jongo speakers (the feature is now available as a software update for the full lineup, so the Pure Jongo S3, Pure Jongo T6, T2, T4, and A2). But is it enough to take on the likes of the Sonos Play:3, the Denon Cocoon Stream, and JBL SoundFly Air? The Pure Jongo T4 is a little taller and a little shorter than a shoebox (the exact measurements are 305 x 146 x 165mm). It's pretty hefty too, weighing 3kg. That's a little heavier than the slightly smaller Sonos Play:3, which tips the scales at 2.6kg. The design is a little underwhelming, especially compared to the sleek lines of the B&W A5. But we love the colour options: you can choose from a range of speaker grilles, including burnt orange, lime green, slate, salted caramel, sandstone, nettle, vermillion, royal blue, lilac and mango. So you're guaranteed to find something to match your cushions. The Pure Jongo T4 is a mid-range speaker, giving you 50W of power. It comes equipped with Wi-Fi and Bluetooth for streaming, and you can pair multiple ones to make a multiroom system, so you can listen to a different track in the bedroom to the lounge, say. Or you can pair two to play in stereo. It's versatile, too. You can mount it on a stand, leave it standalone, or wall-mount it in portrait or landscape orientation, so it's guaranteed to fit in with your setup. (The stand and wall mounts do cost extra, however.) The Pure logo turns as well, so it's always correctly oriented whether you're using the speaker in landscape or portrait. It's the little touches that make all the difference. Setup is simple. You plug in the Pure Jongo T4, and wait for the power light to go green. Press the Wi-Fi button, and after a few seconds the light will flash amber. Turn on Wi-Fi on your mobile device, and select the Jongo network. You'll be redirected to a page where you can enable Bluetooth Caskeid, and tell it which way up you're using your Jongo. Do the same for as many Jongos as you're using, and you're done. It now redirects you to the Pure Connect app, where you can start playing music, tweak the bass, treble, balance, and set the speakers up as a stereo pair. But once you've activated your Jongos, you don't need to use the Pure Connect app again if you don't want to. This is the newest feature, so how does it work? Caskeid is a proprietary technology developed by Pure and licensed to other companies like Onkyo. We even got standard iPlayer working, so we could watch People Just Do Nothing on our phone with the audio playing through twin Jongos. The underground stylings of fictional pirate station Kurupt FM have never sounded so good. Whichever app you use, setup is the same. Start playing a song - in Spotify, say - then pair your device with either speaker via Bluetooth. And that's it, it'll play through both speakers. You can control the volume on the speakers themselves, or from your mobile device using the normal volume buttons. From a mobile, it takes a couple of seconds for the controls to take effect, so don't expect silence the second you press pause. But we were able to control both speakers from another room without any trouble. One speaker did drop out for a few seconds, but this only happened a couple of times in our hours of testing. In the coming months, certain apps will announce that they'll integrate Bluetooth Caskeid, which should make it even easier to use. Sound quality is good but not fantastic. The Pure Jongo T4 certainly goes loud enough to fill a room, but the sound does tend to lack some detail. It packs plenty of punch, just lacks a little clarity. Bluetooth Caskeid promises audiophile-quality playback, and we don't doubt it. But to get the full benefit, you might be better off spending £100 extra and opting for the Pure Jongo T6. Bluetooth Caskeid makes a very good speaker even better. It's a real feather in Pure's cap compared to Sonos and the rest of the wireless speaker brigade. The Pure Jongo T4 isn't without its faults, but if it's a mid-range model you're after, it takes some beating.